A potassium shortage in your plant can cause many undesirable symptoms since it helps the plant transport water, respirate and photosynthesise. Although the symptoms can often be mistaken for other problems such as nutrient or light burn, we have found the most effective way for you to diagnose potassium deficiency in your plant and correct it. 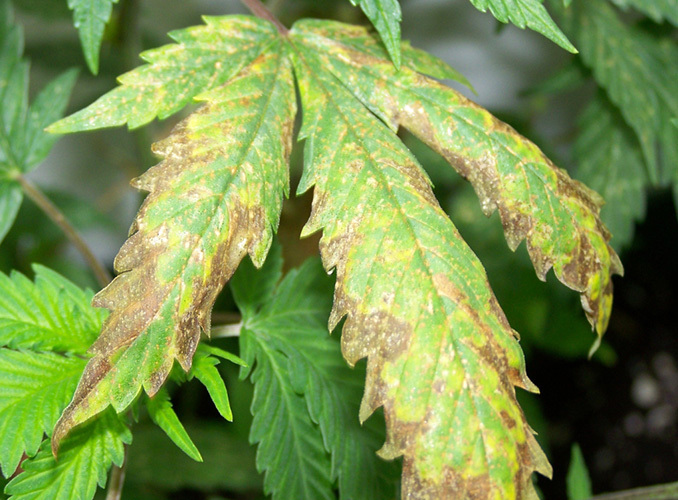 Potassium deficiency is commonly spotted by symptoms found on the cannabis leaf. These symptoms are most similar to an iron deficiency or nutrient burn as it can cause the leaves to appear pale, yellow or bleached, however leaf yellowing also appears between the leaf margins and leaves curl and turn brown as they burn and die. While symptoms of potassium deficiency do appear elsewhere on the plant, the leave symptoms are usually most noticeable. Brown burnt edges or yellowing tends to appear first on the leaves, one of these symptoms followed by the other is a strong sign you have a potassium deficiency. Other areas of the plant affected by potassium deficiency are stretching and weakening of the stem and similar yellowing symptoms found at the top of the plant. It is important to remember that the inside veins of your leaves always stay green if the problem is a potassium deficiency. Powerful LEDs and HPS grow lights can cause sunburnt effects on your plant's leaves if they are kept too close and the symptoms look almost exactly the same as a potassium deficiency, even if the temperature is moderate! If you're having any of the stated leaf symptoms then it might be good practice to move the light slightly away from your plant(s). Remember that LEDs or MH/HPS should never be kept closer than 30cm away and usually further with most models. Stressful conditions are a cause of all deficiencies. Overwatering, heat, transplanting and soil conditions are all factors which may cause issues with your plant, yet the symptoms tend to heal after a restful period. If you are aware that your plant has undergone stressful conditions recently and are only seeing up to a few affected areas around the base of the plant that aren't spreading then try not to worry about it too much. You don't need to start throwing nutrients at your plant when it gets sick as long as your are using good quality soil and nutrients that are cannabis-friendly. Nutrient deficiencies are only likely if you feed your plants with demineralised water from filtering or reverse osmosis. Potassium gets absorbed best in the roots of the plant at a fairly low range. In soil the ideal range is around 6.0-7.0 pH. When using hydroponics or coco coir, potassium has a more efficient absorption rate at a pH range of 5.5-6.5 ph. It is difficult to recover damaged growth from potassium deficiency, however flushing the system with clean water with a correct pH and a consistent dose of cannabis-friendly nutrients should solve the potassium deficiency problem.